Tucked away in a remote village on the Greek Island of Evia (see map below) is a quiet reminder of the joys of living a simple life. The 37, mostly elderly, inhabitants of Antia live a humble agrarian lifestyle against the backdrop of one of the most incredible natural environments on Earth. But their unique whistled language, like so many other endangered languages, is at risk for being lost. Unless a serious effort is made to preserve this nearly lost art of whistled communication and important piece of Greek heritage, it will surely disappear. Unfortunately, the interest in preserving endangered languages is not widespread. Linguists estimate that at least 50% of the world’s languages will cease to be spoken by the end of this century. Because language is the lifeblood of culture, losing languages means closing the door on entire cultures. But there is a small group of people leading the charge to preserve sfyria (from the Greek word sfyrizo, which means “to whistle”) and keep the door to this particular culture open. 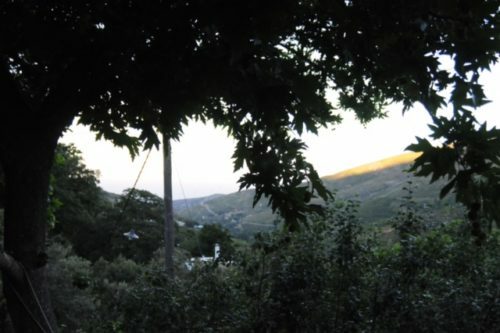 This report, based on videos (like this one) and interviews with locals, who are committed to saving the language, offers an overview of the sfyrian whistled language spoken by the inhabitants of Antia, its importance in preserving the culture and heritage of this majestic place, and the efforts underway to save this rare phenomenon. Sfyria is an ancient language, which has been used exclusively by inhabitants of Antia for hundreds of years. To understand the history and origin of this unusual language, you first need to understand a bit about the topography of the island. Evia is a large, long, and narrow island. Second in size only to Crete, it stretches from the tip of the Pelion Peninsula south to the coast of Attika. To give you a better idea of its size, driving the island, from tip to tip, would take about five hours. 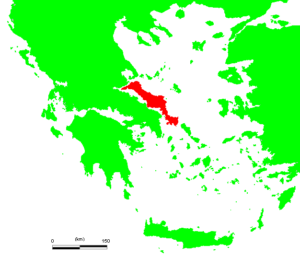 With a geography as varied as anywhere in Greece, Evia has three distinct topographies: the fertile north coast covered in forest; the sparkling Aegean beaches and coves on the east coast; and the mountainous interior with rivers and streams ideal for agriculture, especially in the coastal valleys. Because it is so close to mainland Greece, Evia has been and remains a popular summer holiday destination. But despite the island’s popularity, very few Greeks know much at all about Antia’s history or its fascinating ancient language. Located in central Evia, the earliest inhabitants of Antia survived by living off the land as shepherds and farmers. Shepherds tended their flocks in the highlands traveling long distances each day and migrating with the changing of the seasons. We know that the shepherds used the whistled language to communicate with each other and their families across enormous distances. The high-pitched sound combined with the mountainous terrain helped the sound travel even further. Stepping foot into Antia today is like stepping back in time. The tiny population of villagers continues to live an agrarian lifestyle. The natural environment is beautiful and alive with different sounds. Anywhere in the village, you can hear flowing springs of running water, chickens, lambs, goats, and the wind whistling through the ancient trees. At the right time of day, you may also hear residents of the village whistling to each other in their native tongue. However, few people in Antia continue to communicate this way, since the language hasn’t been consistently passed down to the village’s youngest residents. While the mountainous terrain and need to communicate over long distances made whistling a practical form of communication (long before the invention of smart phones, of course), the fuller explanation of how the remote Antian people began communicating this way is more of a mystery. There is some dispute about the origin of the language, which can be broken down into two main theories. 1. Persian soldiers brought the language to the residents of Antia. According to this theory, Persian soldiers who had been guarding Greek prisoners in the Karystos area, fled into the highlands following their defeat in the Battle of Salamis in 480BC. The Persian soldiers developed this whistled language to avoid letting others know where they were or what they were saying. Villagers later picked it up from the soldiers. 2. Inhabitants of the Island of Evia moved inland and developed the language to protect themselves from pirates. Another theory suggests that the Antian people invented the whistled language as a method of self-preservation. During the Middle Ages, the coastal towns of Evia were destroyed by Sicilian and Venetian pirates. Because the pirates were stealing animals, wheat, and even killing people, residents were forced to flee deeper into the mountains. They developed their own language to warn of further attacks, hide, and protect their property. Regardless of the true origin of sfyria, the whistled language has become the hallmark of the authentic Antian character. It is as much a part of this place as the mountains, the natural springs, and the few old buildings standing in the heart of the village. Anthropologists agree that culture and language are deeply connected, though experts differ over precisely to what extent. According to some scholars, the structure of language, more or less, determines how we see the world. Because the labels and descriptions we choose to apply in different contexts shape not only the way others perceive us, but also how we perceive the world, language plays a crucial role in defining values, customs, and norms. Besides shaping our understanding of the world, language is the medium through which cultural traditions are inherited. So, efforts to preserve endangered languages are about more than preserving a system of sounds. They are about preserving precious and tenuous connections to the past. Because of the close relationship between culture and language, the ancient culture represented not only by the whistled language, but also by ancient artifacts, like the piece of the loom displayed in this video (also known as an antia, for which the village was named), is also at risk of fading away. Watch those trying to save the whistled language talk about the big changes they have seen in the village. As mentioned, not many people even living in mainland Greece today know about the whistled language or even the tiny village of Antia. Consequently, there is very little effort to preserve the language or the culture outside of a select few anthropologists, linguists, and concerned citizens. The inhabitants of Antia are very proud of their unique whistled language and would like to see the tradition continue. Although a few other cultures (for example, the inhabitants of La Gomera in the Canary Islands) have whistled languages, sfyria is the only whistled translation of Greek. Historically, the children of Antia would begin learning the language from their parents around the age of 5 or 6. Parents would teach their children how to position the tongue and move their lips to get the different tones that reproduce the structure of spoken language. As their livelihood began to depend more and more on communicating with others outside of Antia, however, schools began to teach exclusively Greek and preserving the traditional language was left to individual householders. 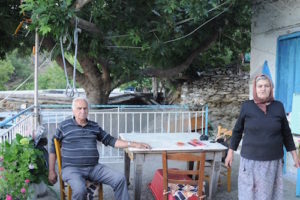 Although the remaining villagers are still whistling in Antia, the population of this remote village is rapidly dwindling as elderly residents pass away and the younger generations leave for cities, like Athens, to find work and earn a good living. Today, very few young people know how to communicate in this way. One man, Yannis Tzanivaris, from another island, who is leading the charge to revive the whistled language, says that only a handful of whistled language speakers remain, of whom only one is young—an adolescent boy. When a language ceases to be passed down, it begins to fade away very quickly. However, as long as whistled language speakers survive, there is still hope for reviving the language. Watch Mr. Tzanivaris explain how he learned the whistled language, what it means to him, and use the language in conversation in this video. One way that endangered languages, like sfyria, can be revived is through a conscious effort by the linguistic community. Linguistics is the scientific study of language involving the analysis of form, meaning, and context. Beyond the interest in how languages develop and change over time, linguists also deal with the social, cultural, historical, and political factors that influence language. When others, especially native English speakers, are first introduced to a whistled language, it is natural to hear it as a sort of “code language.” But in fact, the whistled language reproduces the structure of spoken language making it possible for fluent speakers to convey an indefinite number of complex ideas. For a useful demonstration, watch this video, then continue reading to better understand the structure of sound production. As with explaining the structure of any unfamiliar language to a non-native speaker, the construction of the whistled language is difficult to describe. In basic terms, whistled languages are tonal and convey phonemic information through tone, length, and stress. Whistlers string together different whistled tones in order to form words. These tonal systems can then be translated into Greek. However, there is not a one-to-one correspondence between distinct whistled tones and each letter in the Greek alphabet. While whistlers reproduce the vowels, which set the whistled language apart from other languages, Greek consonants cannot be reproduced easily because they have no tone. Whistlers understand each other by listening for the different tones representing the vowels in the Greek alphabet. Unlike spoken words, whistling techniques do not require the vibration of the vocal cords. Whistling produces a shock effect of the compressed air stream inside the mouth. The air stream expelled makes vibrations at the edge of the mouth and the faster the air stream is expelled, the higher the pitch of the vibration. Because whistled communication requires precise technique, the language is especially difficult for young children and older people who have more trouble controlling the musculature of throat, tongue, and lips. For a more detailed breakdown of the linguistic structure of the language, see our earlier article. Linguists take in depth scientific information about the structure of languages and study different aspects of language development. The whistled language of Antia is of special interest to linguists who study tonal languages. But even beyond the academic interest, linguists working together with government officials can save rare languages like this, as a matter of immense cultural significance. They use their skills to use preserving rare languages through creating language guides, making recordings of the language, and raising awareness. Used as a means for shepherds to communicate over long distances in this mountainous region and also as a regular means of conversing with one another, the practical case for preserving the whistled language has virtually vanished. Because of the decreased agricultural and pastoral activities, most inhabitants have left the village to seek employment elsewhere. With its livelihood, the village is loosing its whistled language. In addition, with the widespread availability of smart phone technology, there is little use for communicating across long distances using this relatively primitive method. Today’s whistlers communicate mainly as a way to participate in a cultural tradition. This is one major obstacle to increasing support and gaining the public’s attention about the potential loss. With the emphasis on languages that further global commerce and make it easier to do business internationally, economic necessity has forced into extinction many languages perceived as having lost their usefulness. As a result, language is becoming less diverse at an unprecedented pace. Linguists are familiar with thousands of similar cases of language extinction, including ancient Greek, to name but one example. These barriers make it even more crucial for linguists to take on the project of helping to revive the whistled language of Antia. For a long time, the Antian people believed that there was no hope for saving their beloved whistled language. Although government officials within and without the village showed interest in preserving the culture in Antia, they viewed the language itself as low-class being a vernacular used only by shepherds. So, it was very difficult to build momentum around preserving the language. However, in 2010, the Antian people, led by Yannis Tzanivaris (who you see being interviewed in the videos above), decided to take matters into their own hands. Their main method of revival has been initiatives for teaching young people to communicate in this way. In 2012, they also organized a festival in Antia celebrating the language and culture. This festival stirred up interest among younger people both in Greece and in other places around the world. As a result, there have been museum exhibits in several countries and a documentary film shown at the Metropolitan Museum of Fine Art in New York. Mr. Tzanivaris began teaching classes in Antia and he still has the blessing of local officials to use the school in Antia (which officially closed in 2003) to continue teaching classes and researching the whistled language. While he has their blessing, he doesn’t have much else to make his dream of reviving the language a reality. He teaches these classes free of charge, but because he no longer lives in Antia himself, he must travel to teach the classes. This is becoming cost prohibitive. Mr. Tzanivaris and those on his side in this battle look forward to the day when people will stop talking about sfyria as a disappearing language and instead begin speaking of it as a survivor. Not long ago, it seemed that we were headed in a positive direction, but the quest to save the whistled language of Antia seems to have lost steam once again. Still, Mr. Tzanivaris is determined to continue his awareness campaign. This BBC article by Eliot Stein, who traveled to Antia with Alpha Omega’s CEO, Dimitra Hengen, this summer is one small step in the right direction. Tzanivaris has also begun the process of filing with the Greek Ministry of Culture to gain recognition as a national heritage language. He has taken his fight internationally submitting to UNESCO for recognition. But what Tzanivaris needs most, besides increasing public awareness about the potential loss of this rare language, is help from linguists and financial support so that he can continue his efforts. If you are interested in offering your support, contact Alpha Omega Translations (info@alphaomegatranslations.com). For more information watch this video from BBC Travel. Update (December 2017): This story has also been featured on Sorosoro.com, which is a collaboration of researchers, linguists, and anthropologists interested in doing their part to preserve endangered languages around the world. Sorosoro sends scientists and technical experts around the world to document rare languages. Another of our earlier articles on the Greek whistled language from October 2013. Eliot Stein’s article originally published on BBC Travel. Our earlier articles on the whistled languages used on the Canary Islands and in Turkey. We are so happy to see this. Let’s keep sharing this story and reaching even more!